It should not be a case of redevelopment at any cost. It is completely unacceptable that the club comes here and offers nothing. You cannot pass this with no social housing, it is just wrong. Tottenham's Trojan Horse? Dr Mark Panton researched the impact of football stadium-led regeneration projects for his PhD at Birkbeck and has now turned his thesis into a graphic book. 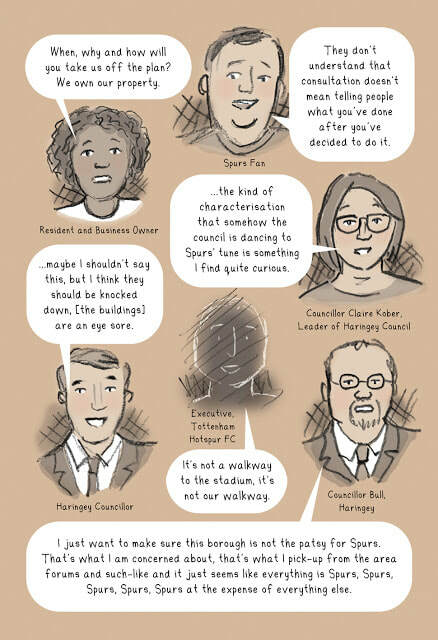 The book centres around a proposed fans' walkway from the site of a relocated White Hart Lane train station entrance to the new Tottenham Hotspur FC stadium and will require the demolition of homes. The page below shows a range of reactions to the proposals. All dialogue came from interviews with real people but unless they have been named their appearance has been altered to protect their identity. Three listed buildings are to be demolished in order to widen the pavement for “crowd safety”. Haringey’s planning policies call for major developments to provide 20 per cent of their energy needs from renewables like solar panels, but Spurs’ plans will only provide 0.3 per cent, less than one sixtieth of the target. The scheme was monstrous in appearance including the creation of tall, monolithic residential towers. No declarations had been made by Council representatives regarding past attendance at MIPIM international property events. The scheme reflected the Council ‘giving in’ to the Club. The scheme would provide no social or affordable housing and would result in the demolition of a housing estate. The Council was facilitating non compliance with its own 50% affordable housing target which was scandalous for such a large development scheme and thereby constituted a social cleansing plan. A precedent would be set for other schemes coming forward relating to lack of compliance with affordable housing targets. An application for redevelopment of West Ham’s Upton Park stadium had recently been rejected by Newham Council despite a proposed 22% affordable housing contribution. The scheme was projected to be non compliant with London Plan targets for reductions in carbon emissions and as such should be subject to a financial penalty or requirement to be met off site. Sufficient consideration had not been given to alternatives such as photo voltaic panels. The scheme should contribute, and preferably act as the centre, for a district energy network. No commitment had been made for carbon reduction despite being a state of the art stadium. That out of 585 dwellings, there are zero per cent that are affordable, is an absolute scandal. This is part of a social cleansing plan directed at a poor community. This article presents case study research of the stadium-led regeneration project involving Tottenham Hotspur FC and the London Borough of Haringey, focusing on the community perceptions of urban regeneration. It has two aims: first, to understand the local authority’s approach to regeneration in the context of the austerity agenda, and second, to understand how this approach was perceived by, and the impact on, those communities living within the geographical locality of the developments.